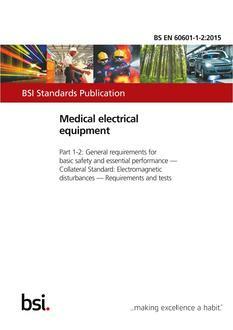 BS EN 60601-1-2:2015 applies to the BASIC SAFETY and ESSENTIAL PERFORMANCE of MEDICAL ELECTRICAL EQUIPMENT and MEDICAL ELECTRICAL SYSTEMS, hereafter referred to as ME EQUIPMENT and ME SYSTEMS. 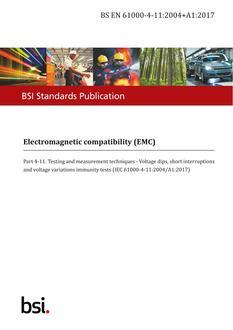 This collateral standard applies to the BASIC SAFETY and ESSENTIAL PERFORMANCE of ME EQUIPMENT and ME SYSTEMS in the presence of ELECTROMAGNETIC DISTURBANCES and to ELECTROMAGNETIC DISTURBANCES emitted by ME EQUIPMENT and ME SYSTEMS. BASIC SAFETY with regard to ELECTROMAGNETIC DISTURBANCES is applicable to all ME EQUIPMENT and ME SYSTEMS.